If you are interested in how South Ayrshire will look in the future, then South Ayrshire Council wants to hear from you during a major consultation exercise, which is now underway. The Council is consulting on its Main Issues Report, which sets out options for changes to key planning policies and on where developments should and should not take place across South Ayrshire. The report and the feedback received during the consultation will be used to draw up South Ayrshire’s Local Development Plan, which will set out how our towns and countryside will be managed over the next 10 to 20 years. The Local Development Plan will be the main consideration when determining planning applications. It could potentially impact on everyone living and working in South Ayrshire, so it’s important you have your say. * responding to climate change. The issues it considers include how to maximise the potential of the major gateways like the airport, minimise transport congestion and where future housing developments should be located. Local people are now being asked for their views on these very matters. 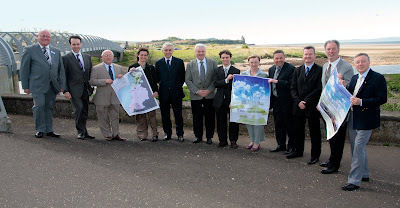 Councillor Margaret Toner, Portfolio Holder for Economic Development, Tourism & Leisure, and Chair of the Local Development Plan Project Board said: “I cannot stress enough how important it is for the residents of South Ayrshire to get involved in this consultation exercise. The Main Issues Report and the Local Development Plan will set out the framework for the changes that will happen across South Ayrshire in the years to come, so make sure you have your say now. “I know it can be hard to imagine what something like a Local Development Plan might mean for you but this will be the major document considered when determining planning applications regarding – for example – new supermarkets, houses or transport interchanges. South Ayrshire Council has organised four community discussions to provide the opportunity for local residents to find out further information and to ask questions on the Main Issues Report. A further session is also being arranged in Prestwick for the end of June/ early July. The consultation closes on 12 July 2010. There are currently 705 Ayrshire business stories permanently archived on this site. To locate those of most interest to you, please use the site search facility in the top left hand corner of this page. Type your search term in the white box, then click the magnifying glass symbol.